The feature works by creating an empty group and copying your selected data into it along with any files you choose for easy distribution or backup. The end package file that is generated from Pack and Go is a .drivepkg file. This is essentially a zip file that can be stored or sent to other people so that you can move your implementations easily. It can also be used to backup and restore old versions of your implementations. Copying of security is mandatory as you will need a way to sign into the group, as such all information is always copied for packaged groups. One of the common uses for Pack and Go is allowing you to easily create Backups of Projects. 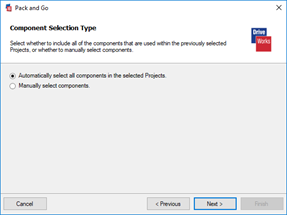 Detailed below is a example of how you would Pack and Go a Project and then create a Configuration XML file to allow you to easily rerun the same Pack and Go. 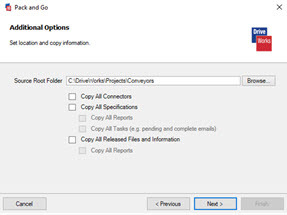 Within the Data Management Tool navigate to the Tasks Tab and select Pack and Go. This will open up the Pack and Go Wizard. 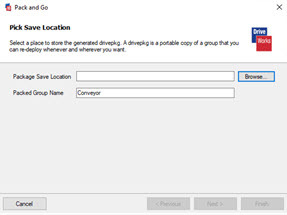 Select your location that you want to save the .drivepkg file to by clicking on the Browse button. 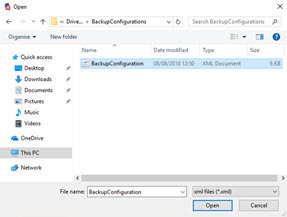 Once you have navigated to the location where you want to create your backup give the .drivepkg file a name and click Save. In this example the Drive Package will be called BackUp5. The Group included in the Drive Package can be given a new name using the Packed Group Name box. This will be auto populated with the existing Groups name. This is an optional step and not necessary to create a Drive Package. 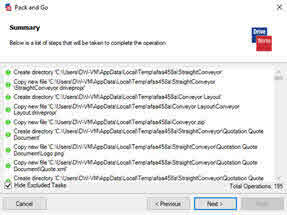 Use Configuration is and option that allows you to upload an XML file that has the previous settings saved for the Pack and Go process meaning that you do not have to go through the Wizard again. 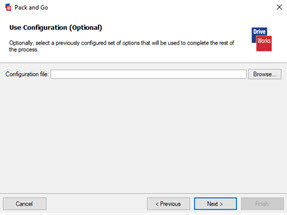 Please see the section How To Use Pack And Go Configurations for more information about this functionality and how to use it. Next select the Projects to include in the Drive Package. 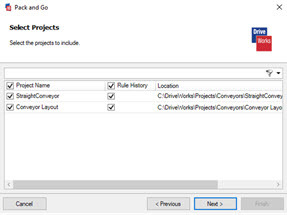 You can also select if the Rule History for each project is to be included. 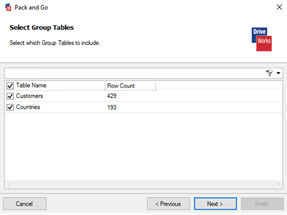 Next select the Group Tables to include in the Drive Package. Next select any additional options that you want to include in the Drive Package. 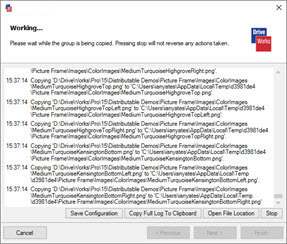 Selecting Copy All Specifications and Copy All Generated Files and Information will dramatically increase the size of the Drive Package so consider if it is truly necessary to back these up. Next step is to review the files that are being selected to be included in the created Drive Package. Now review the Summary. This details the creation process of the Drive Package. If you don't want to create a Configuration XML file for the Pack and Go click finish to end the wizard. If you do want to create a Configuration XML file please follow steps 13-15 instead. Select a location to save your configuration and give it a name. By default the file location will C:\Users\[UserName]\AppData\Roaming. This does not have to be the location where the XML will be saved to. Click Save to created the file. Click Finish to exit the Pack and Go Wizard. 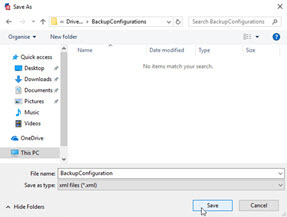 When you create a Drive Package using the Pack and Go tool there is the option to create a Configuration file. This file is an XML file containing a copy of all the settings you used when creating the Drive Package. This means you can replicate the same Drive Package without having to go through all the selection process again. To see how to create a Configuration please see steps 13-15 above in the How To Pack And Go Your Project. This example shows how you would use a Configuration XML file to create a new Drive Package. First select your location that you want to save the .drivepkg file to by clicking on the Browse button. 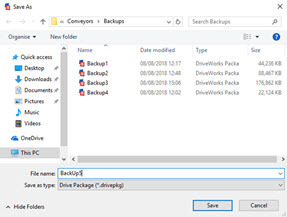 Once you have navigated to the location where you want to create your backup give the .drivepkg file a name and click Save. In this example the Drive Package will be called BackUp6. 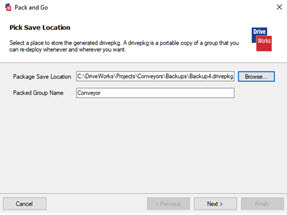 Now click the Browse button to select a Configuration File to use to create the Drive Package. 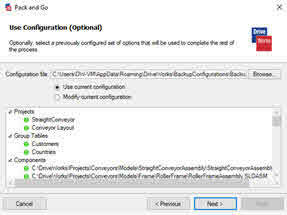 With a Configuration file selected make sure that the option to Use Current Configuration is selected. 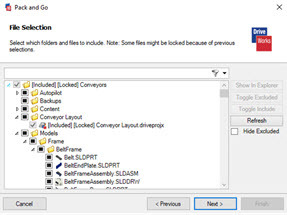 When you upload a Configurations file the Use Configurations Window changes to show what is going to be included in the created DrivePackage using the giving Configuration File. If you want to change edit the contents then you can select the Modify Current Configuration option to go through the wizard to make the changes you desire. The Pack and Go Tool uses a very similar process to Copy Group. To learn more about this please visit the Copy Group Help File page.